Volunteers braved some wet weather and came out in force to support this year’s Big Dee Clean-Up in Cheshire West. 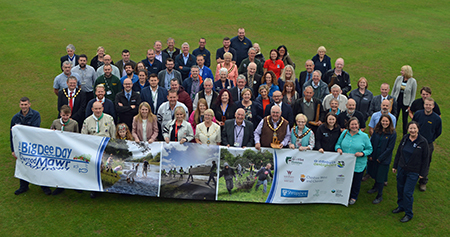 The annual clean-up, organised by Cheshire West and Chester Council, Flintshire Council and Natural Resources Wales, returned bigger and better than ever, for an impressive twelfth year. Teams of volunteers worked at locations in Handbridge, Neston and also Caldy Valley, where a well-attended community event took place. Staff from Tesco stores in Helsby, Sealand Road, Broughton and Chester city centre took it in their stride to make some much-needed improvements to the walkways along the River Dee opposite the Groves, near to the Queens suspension bridge in Handbridge. Tasks included scraping off encroaching vegetation on the sides of the pathway and cutting back over-hanging vegetation near to seating benches to reveal a much wider walkway and inviting places to rest and admire the surrounding views. Staff also took it in turns to litter pick to give the area a finishing touch. Council Greenspace Officers supervised the day and were really pleased with the turnout and commitment of the staff. Volunteers from Qwest Services braved the weather to help maintain the dell in Stanney fields in Neston, a tributary of the River Dee. They cut back vegetation along the Dell area and tidied up the riverbed itself. The weather worsened in the afternoon, but they persevered completing the entire task. The Friends of Caldy Valley Park hosted a very successful community event at the end of Big Dee Clean-Up Week. Despite initial rainy weather around 70 people came along to celebrate their greenspace and enjoy nature crafts, face-painting, games for younger children as well as refreshments. This year’s Big Dee Clean-up was hosted by Cheshire West and Chester Council and a launch and awards ceremony took place in Neston at the start of the week. The awards recognised businesses and organisations that have supported Big Dee Day for a number of years. Councillor Karen Shore, Cabinet Member for Environment said: “What a wonderful achievement for everyone involved with the Big Dee event in Cheshire West. Everyone has achieved fantastic results.